Ireland’s diverse placename heritage richly illustrates the country’s history, archaeology, physical features and natural environment. It has the potential to act as a repository of information, which may otherwise be lost. Viewing the evolution of Irish placenames, it is clear that a multitude of influences has acted upon them, and that the arrival of each new group, such as the Vikings, Anglo-Normans or Plantation settlers, has contributed to the evolution of placenames in Ireland. Placenames are not static but change and evolve as new influences are exerted. Some placenames in the civil parish of Turlough will be explored in this contribution. It is located in the barony of Carra in Co. Mayo and covers an area of 100 km2. 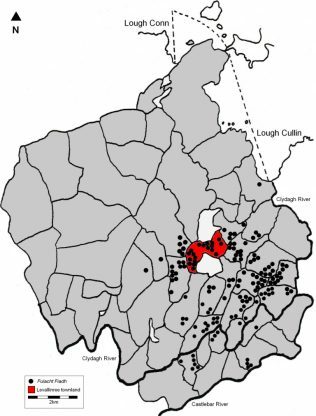 This contribution will consider the association of placenames and archaeology in the civil parish of Turlough by using a number of townlands as examples (Fig. 1). This townland name takes the Irish form Leath-Bhaile an Ríogh ‘Half Town of the King’. John O’Donovan of the Ordnance Survey translated it as ‘Half Quarter of the King’, although quarter usually manifests itself in placenames as Ceathru or ‘Carrow’, as in the neighbouring townland Carrowmacloughlin. This evidence would suggest that this townland was perhaps once the seat of a king or chieftain, whose name is no longer known. In addition to numerous fulachta fiadh (Fig. 2), Levallinree is home to two ringforts, while the remains of six crannogs have been discovered in Levallinree Lough. While some crannogs were royal sites occupied by the wealthy and prestigious in Irish society, they were not exclusively the preserve of the wealthy. It must be remembered that the Rí mentioned in the townland name may have been a petty king or local chieftain. In the schools’ manuscript collection of 1938, Levallinree Lough was referred to as an “enchanted lake”, containing a sunken town. The largest crannog is surrounded by a treble oak palisade and four dugout canoes were found near it. Such evidence would suggest that this crannog may have been occupied by the Rí or king. Early Irish law tracts record that the rath (ringfort) of a king was surrounded by three ramparts. Similarly, the use of a triple palisade at this site is likely to be indicative of the status of its occupants. It has been dendrochronologically dated to AD 609. This places its construction in the early medieval period (c. 400 – c. 1100), during which a significant amount of crannogs were constructed, although there is evidence for their construction from the Bronze Age onwards in Ireland. Three iron tools were discovered in this crannog – a woodman’s axe, a spade (Fig. 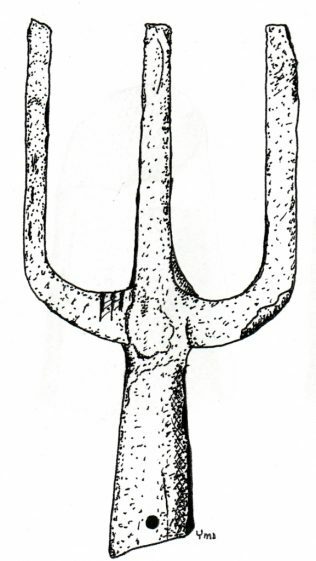 3) and a three-pronged spear (Fig. 4), all dating to the thirteenth century. 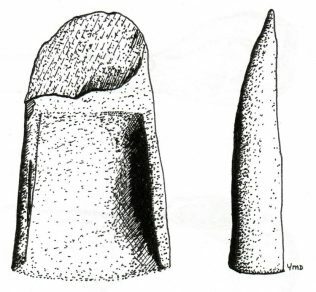 These may indicate continuity of use of the crannog from the date of its construction onwards or that it was abandoned at some time and subsequently reoccupied. There is evidence for the occupation of some crannogs in Ireland into the sixteenth and seventeenth centuries. The name Derryhick is derived from Doire nÍce. Doire is commonly taken to mean oak-wood but can also signify a wood, grove or thicket. Íce can mean addition or appendage and is also the genitive singular form of íoc, healing or cure. This evidence lends credence to John O’Donavan’s contention that the townland name means ‘Oakwood of the healing’. The chronology of archaeological evidence in this area begins with a standing stone. An ecclesiastical enclosure of early medieval date is also found in the area. Pagan beliefs were associated with standing stones, thus the Christian clergy disapproved of them. Often instead of destroying the monuments, they were rededicated as Christian monuments and used as a means of making Christianity more acceptable to potential converts, incorporating elements of the older beliefs into the new religion. Instances of such practices have been recorded in Ireland and around Europe. It is therefore possible that there may be a connection between the Derryhick standing stone and the ecclesiastical remains. This would not be entirely without precedence, as the ‘Christianisation’ of many originally pagan wells in Ireland illustrates. A variety of functions have been proposed for standing stones, including as markers of burials, boundaries or notable events such as battles. Many are associated with legends, such as the one which describes the death of Cú Chulainn, who tied himself to the standing stone at Clochafarmore Co. Louth for support while dying of his wounds. Two fieldnames to the south of the standing stone in Derryhick support the connection between standing stones and conflict, at least insofar as the phenomenon manifests itself in the folk memory. One field is called Garraí a Sáthadh. Garraí signifies a small field or plot, possibly enclosed, as well as a ring or halo. Sáthadh derives from sá, meaning thrust, stab, push, press, dart or lunge. This fieldname can be translated as ‘Field of the Stabbing’, suggesting conflict, as does a nearby two field area known as Páirc a Chlampair. Páirc means field and clampar suggests a wrangle, noisy quarrelling, commotion or trouble. ‘The field of the noisy quarrel’ is in close proximity to two ringforts. A collapsing area or souterrain is located less than fifty metres from one of these ringforts. Souterrains are commonly associated with ringforts and ecclesiastical sites. They vary from simple underground chambers to complex systems of underground passages connected by narrow spaces called creeps. It is likely that souterrains were used for refuge or storage. Storage is often indicated by the presence of shelves and cupboards. Souterrains made ideal storage facilities as their underground location ensured a more constant temperature than was possible above ground. 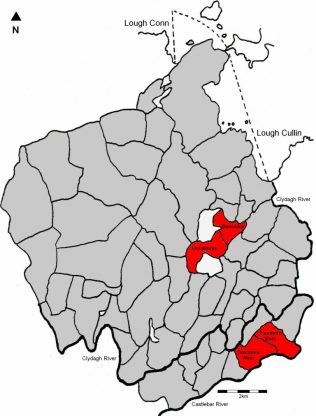 This townland name is variously spelled as Tooremore, Toormore, Tourmore and Tuarmór. ‘Toor’ is an anglicised version of Tuar, as meaning ‘bleach-green’. Significant areas of both Toormore East and Toormore West, however, are marked on the Ordnance Survey six-inch maps as ‘liable to flooding’, a common feature in Turlough. It has been suggested that this name may be connected with a flax pond in Lack East, used for retting flax which could then be dried out on the bleach green on the south-facing hills of Toormore East and West. Lawless, C. (1991). The Derryhick Megalith and ancient settlement at Turlough, Castlebar. Cathair na Mart: Journal of the Westport Historical Society. No. 11, pp. 20-30. Lawless, C. (1996). Levallinree townland and Lough: An ancient citadel. Cathair na Mart: Journal of the Westport Historical Society. No. 16, pp. 17-44. Lawless, C. (1998b). Turlough, Co. Mayo: A landscape study. In: Barton, K., and Mollloy, K., (ed.s), South Central Mayo: Field Guide No. 22. Irish Association for Quarternary Studies, Dublin. Mitchell, F., and Ryan, M., (1997). Reading the Irish Landscape. Cork University Press, Cork.